Woman’s Own Money Saver – on sale today! 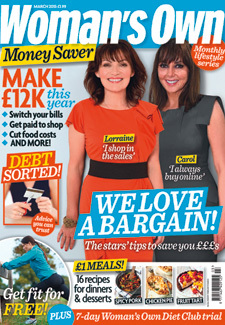 We know how hard it can be to make ends meet, so we’ve put together a new magazine full of expert advice, money-making ideas and tried and tested readers tips. We’ve been inspired to tackle our finances, try out the bill slashing devices around the home, and now we know where to shop for the real bargains on the high street, there’s not stopping us. So pick up your copy today and join in! – Supermarket beauty cream – it’s won awards!